On Saturday 10th September, Jermaine Jackson unwittingly provoked a media storm. He was on the promotional trail for his new book when a news story misquoting a section of the prologue was duplicated hundreds of times around the world, sparking a huge backlash against the memoir. The story wrongly claimed that had Michael Jackson been convicted of child molestation in 2005, his family had an escape plan in place to whisk him to Bahrain, where he couldn't be extradited. The story was controversial and nonsensical. It was also untrue. Wherever the story originated, the journalist responsible was apparently too lazy even to read Jermaine's eight-and-a-half page prologue in full before they wrote it up. Then, several hundred more journalists replicated that story without making any attempt to fact-check it. The furore was such that Michael Jackson's 2005 lawyer Thomas Mesereau publicly spoke out against the claims. For Jermaine Jackson, watching his book misquoted on a global scale and seeing himself criticised over a story he never wrote was a disaster. He was marketing his book as an honest firsthand account of his brother's life, but it had scarcely hit shelves before it was made to look like a work of fiction. It was amidst this controversy that Jermaine Jackson flew to London to promote the book - a trip I didn't find out about until he was already on his way here. Arranging an interview slot involved three days of negotiation between Jermaine, his publicist and representatives of his publishing house on both sides of the Atlantic. In the meantime, though, I got a brief private introduction 'backstage' at his London book signing on Tuesday 13th September. During our meeting, Jermaine thanked me for my work on his brother's trial and we spoke about his trip to the UK so far. He also reminisced about the Victory album when my friend Angela (above, left) handed him a copy to sign. On the Wednesday evening, waiting to hear confirmation of my interview slot, I tripped over in my local park and landed with my hand in a patch of broken glass. 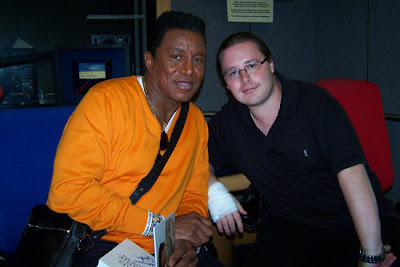 On route to A&E, I learned that I would interview Jermaine Jackson the following day at the BBC studios. On the afternoon of Thursday 15th, Jermaine's car picked me up in Wood Lane and delivered us all to the BBC studios. Now on his fourth consecutive day of back-to-back interviews in London, he'd just finished recording Loose Women and was at the BBC studios to be interviewed by Richard Bacon. We were taken to an empty radio studio where Jermaine and I spoke for over half an hour about the backlash against his book, his family's struggle against biased reporting, how they coped with his brother's child molestation trial, and how racism affected the family both during the Jackson 5 days and in later life. We discussed how he felt about the decision to put his brother's children onstage at the upcoming tribute concert in Cardiff (which happened on Oct 8th), his annoyance at the Los Angeles justice system's obsession with holidays, and the shocking content in chapter 22 of his book, which recounts his sources' recollections of the 'This Is It' rehearsals. And we discussed a whole lot more, too. Shortly after our BBC studios interview, Jermaine was generous enough to answer several more questions via email correspondence. I have woven those quotes into my article alongside the quotes from our in-person encounter, because it is too jarring and wastes too many words to keep differentiating between the two. My interview with Jermaine will be serialised on the Huffington Post. Part one is now online (link below). Keep checking the blog and my twitter page for updates on future installations.